I’m a fairly handy homeowner, with a good set of the usual sorts of tools; I’ve had a friendly acquaintance with wrenches, players, hammers, screwdrivers, and more for many years. But until very recently, I’d never heard of a tap and die set. I had a handmade coffee table that was put together with nuts and bolts on each leg. When the bolts stripped (after almost twenty years of use!) I took one to the local hardware store to replace it. Nothing was a perfect match, however, and the sales person ended up showing me a tap and die set and steel rods in the appropriate length. It turns out that a tap and die set is used to create internal and external threads in metal. Many lightweight sets are used to strip rust, carbon, or other detritus off already cut nuts and bolts; other, more durable sets can create fresh threads. Which Tap And Die Set Should You Choose? Which Set Is The Best ? There are several common uses for tap and die sets. Auto mechanics might be the most well known casual users of these tools; they are frequently used to clean spark plugs that have accumulated carbon and aren’t working well. Another common use is to take older nuts and bolts and clean the rust or carbon off, so that they can continue to be used. The downside of cleaning old hardware instead of creating or using new is that some of the base material will be cleaned off the hardware as well. This can cause the nut and bolt to have an insecure attachment, and cause the overall structure to be less stable through time. Finally, tap and die sets are frequently used by those who are making their own hardware. From locksmiths, who may be dealing with older materials that were custom created at that time to specialty materials that are difficult to replace. Auto mechanics may need to drill through engine blocks or other frame pieces to work on custom cars. And those who, like my friend from two decades ago, build their own furniture, may find it more efficient and less expensive to create custom hardware. While the inner workings of a hammer and screwdriver were fairly obvious to me, figuring out how to make a tap and die set work well took a bit more doing. I spent a good chunk of time reading instru﻿﻿ctional articles, and even found this helpful Youtube video that cleared up a couple of confusing steps for me. Use cutting oil. With a tap and die set, you are using metal to cut metal, and that generates a substantial amount of heat. If you don’t mitigate that heat with some lubricant, you can warp your tap or die, break them off, or end up with threads that don’t match up well. Keep taps and dies aligned straight up and down. Some kits include tools which attach to your materials to help keep everything properly aligned, but many serious crafters clamp their items to their﻿ ﻿﻿workbench to make sure nothing shifts. If you don’t have your taps and dies properly aligned, again, you will create threads that don’t match up, and potentially break your tools. An important note: after the first two threads or so, you won’t be able to adjust the direction of the threads; if they are misaligned, you will need to discard the materials and try again. Every few twists of your T-wrench, reverse direction to clean out the cut material from the threads. This is particularly important if you’re “drilling blind,” meaning that the cut material can’t fall out the bottom of the hole because it doesn’t go all the way through. Take your time! Clean cuts are going to last better and cause less wear on your tools so that they hold up over time. Measurement types. While the highest end tools used by people who reach for their tap and die sets every day are often either metric or SAE. 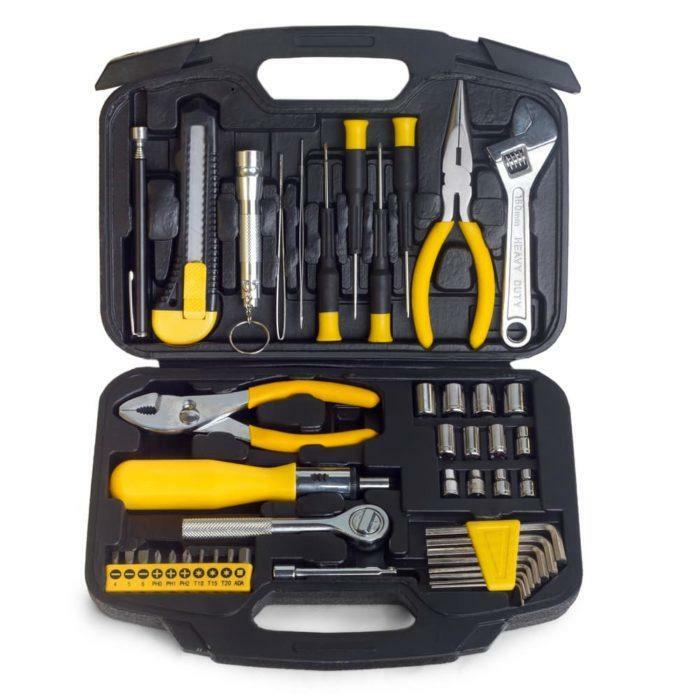 Most tool sets available for the average homeowner or occasional user offer both metric and SAE in the same set. If you expect to use both types, you will want your kit to include both. Case quality. Like any tool set, you will likely be taking pieces out of your set and replacing them on a regular basis. You want to make sure your case will open and close easily, and that pieces will be properly held by the case. There’s nothing more frustrating than opening a tool kit and having pieces scatter all over the floor of your workshop. Appropriate sizes. Between the treads per inch and the various diameters, there are many different sized combinations for both taps and dies. Knowing which sizes you need will let you make sure that your set is ready to go as soon as it arrives. This may be more of a concern if you are trying to fix existing hardware, as opposed to creating it fresh. Tool material. It takes a substantially harder material to cut new threads in steel than it does to clean rust off an existing bolt. Using taps and dies that are not strong enough will result in either breakage, or holes that don’t line up properly, wasting time and materials. Down below you will find individualized reviews for the tap and die sets in this chart; click the links above to find up to date prices on Amazon. Alloy steel is strong enough to clean threads and support general use. Alloy steel is not strong enough to cut fresh threads in new steel. While the taps do have molded spots that hold them securely, the other pieces are loose in their spots; if the case is opened upside down, parts will fall everywhere. Again the taps and dies are not secured in their designated locations, so make sure the case is opened top up. For the casual homeowner who only intends to use their set occasionally, the budget Truepower set will get the job done. The steel is durable enough to cut a few fresh threads, and some friends report using this set to cut through cast iron, as long as they used plenty of lubricating fluids. But if your business or your home shop depends on your tap and die set working reliably, the Irwin Hanson set is simply better. It is more expensive, but it has more of the various pieces you’ll need to successfully complete your job, and the case is going to hold up better to being carted around and used in various locations. In general, with tools, you get what you pay for, and buying a tap and die set is no exception.